The tabla (Hindi: तबला, Bangla: তবলা, Urdu: تبلہ tablÄ� from Arabic: طبل، طبلة tabl, tabla) is a popular Indian percussion instrument used in the classical, popular and religious music of the Indian subcontinent and in Hindustani classical music. The instrument consists of a pair of hand drums of contrasting sizes and timbres. The term tabla is derived from an Arabic word, tabl, which simply means „drum.“Playing technique involves extensive use of the fingers and palms in various configurations to create a wide variety of different sounds, reflected in the mnemonic syllables (bol). The heel of the hand is used to apply pressure or in a sliding motion on the larger drum so that the pitch is changed during the sound’s decay. 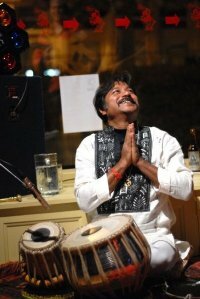 Sree Debasish Dass (Pintoo) Born in a very tradtional musical familly on May day, Sree Debasish Dass has carved a special niche for himself in the world of Tabla, the king of Indian percussion instruments. He was initiated into Tabla at the tender age of five by his beloved father Late Dilip Kumar Pandit a highly acclaimed Tabla player of Farukkabad Gharana. True to his date of birth, which symbolises sincere labour, Debasish (popularly known as Pintoo) put in years of relentless effort and unfailing dedication to master the art of playing Tabla. He completed his graduation from the world famous Visva-Bharati University founded by the great Rabindra Nath Tagore. Thereafter he plunged fully into the subtle complexities Tabla and completed his Diploma in music, Bachelor and Master degree in Tabla. And there after; Late Pandit Dilip Kumar Das too our family to Satiniketan where he joind in the world famous University there as a professor. When ever I come to Europe I feel there is a great need for the elderly people who needs care…….. So I have dream to start a place where my spiritual family members will come during the winter and stay with me….. Where there will be somepeople who will take care of them and there will be Yoga and music every day……… there will be a place where they will walk and walk with self esteem too. I do not know how but I feel I must do this….. because I have got much from them….. This entry was posted by admin on 25. Oktober 2009 at 15:34, and is filed under Musik,-Takt & Tonlehre. Follow any responses to this post through RSS 2.0. Responses are currently closed, but you can trackback from your own site.